In my ongoing process of cleaning up all of my music in all of its mediums, I found myself playing CD-Rs in my Jeep to determine which were OK to discard. Kool & The Gang’s Sea of Tranquility begins to play and I’m listening, trying to figure out who did this instrumental cover of D’angelo’s Send It On. (Yeah, right?) I did a Shazam (lol) and when I saw it was K&TG, the idea to do this mix was born (Inspiration is everywhere). 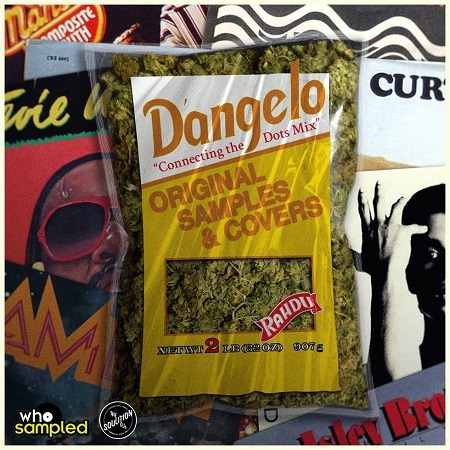 I knew a lot of the samples used, but went to whosampled.com to locate any I missed as well as any extra obscure sources. I ended up with just enough for what I thought could be a cool project. The mix quickly turned into a chore amidst the loss of several loved ones and I considered giving this up because I just didn’t have the energy. While listening to a DJ Premier interview on Hannibal Buress’ Handsome Rambler podcast, Primo begins talking about how D’angelo ended up with the Devil’s Pie beat and I viewed it as a sign to keep going. (Too coincidental to be a coincidence, right?) I persevered, arranged and rearranged the order of songs, & sought interviews and samples I didn’t own before I finally reached out to Chris Read (DJ #1), Head of Content, at whosampled.com and voila. In the end, the mix turned out to be quite therapeutic and I discovered a lot of great tunes in the process. Just pressed play…and I’m excited!